I've been trying to address the speaking and listening standards in my classroom during Morning Meeting since my class is working on building effective communication skills. I've been checking around for different strategies to help with this, and I found a great way to help kids organize their thoughts and differentiate between the main idea and supporting details while they share. Whether you are building on this concept during literacy instruction, or you are trying to support your students to be more organized, this post is for you! Dialogue sharing: one student shares something with the whole class. Partner sharing: students share with each other in partnerships. Circle sharing: each student shares one short thing with the class. No matter which type of sharing you do, you can choose to have your kids share about a particular topic or have more of a free-form share. I call this type of share a main idea and details share. Personally, I find this is best when used during dialogue sharing, when one student shares with the entire class, but if you have enough materials (and patience!) you could use this for partner sharing too. You will need one container and three to five small items to put into the container. 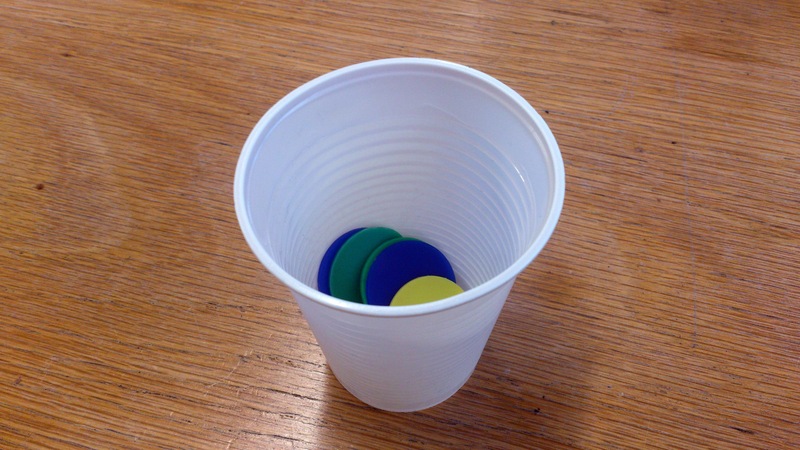 I like to use math manipulatives and a cup for this since I always have them ready for use in my classroom. Model the share for your students. end." That's your main idea. Put the empty container in front of you to symbolize your main idea. Next, add each of the smaller items into the container one by one as you share a relevant detail for each item. The rest of your share about the carnival might sound like this: “I rode on the merry-go-round 3 times with my brother.” (put first item in container) “Next I got my face painted like a tiger.” (put next item in container) “Then we ate ice cream before we went home.” (put last item in container). You can ask kids what they noticed after you model if you want to bump it up and get really academic with this. Guide them to notice transition words, how each detail supports the main idea, etc. Afterwards, students can say that they are ready for questions. We've started working on this in Morning Meeting, and I do see that it has helped some of my students who are struggling to grasp main idea. 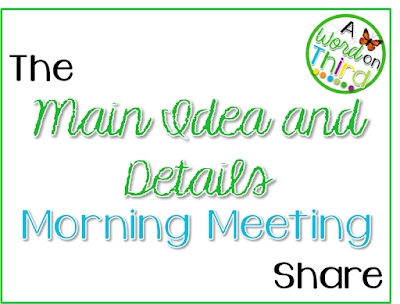 The more academic content we can squeeze into Morning Meeting, the better!! How do you get your kids to build main idea skills? 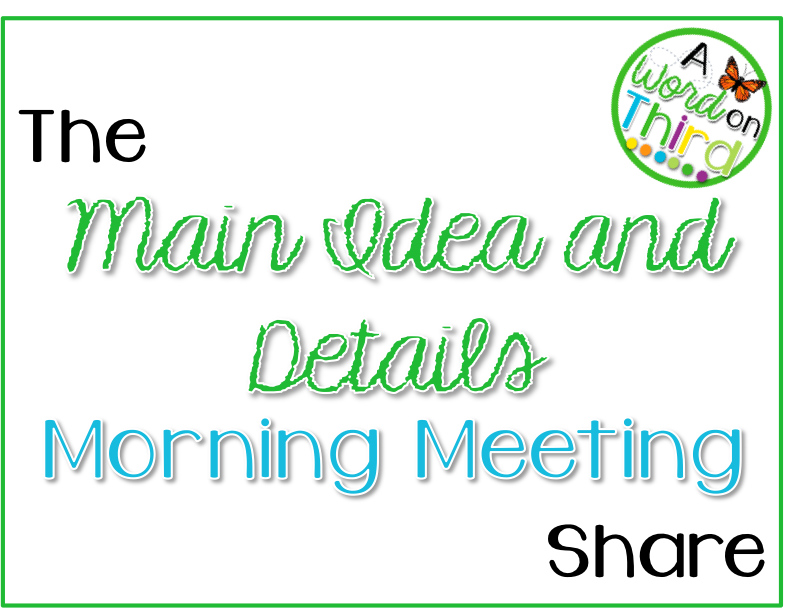 How do you share in Morning Meeting? Let me know below! What a unique idea ~ I love this. Plus, some of my students just keep rambling on with no main idea! Thanks for sharing this! Thanks, Susan! The same thing was happening to me too. No more rambling anymore... and no more leaving out all the details either!! :) I hope this helps!